The Wavescape stays in the Loftsails lineup as their “manoeuvre wave four-batten” sail. It has been completely redesigned for the new season, which is clear to see when comparing the dimensions of this year’s design with that of its predecessor. Taller and narrower in outline, the most significant change is that this 5.0m is now recommended for use with a 400 cm mast rather than a 370 cm. A reduced luff curve and the introduction of a Dacron luff panel are some of the other changes that designer Monty Spindler has implemented in order to fulfil the desire of his team riders for lighter handling and a softer power delivery. Rigged here on a Team Edition 400 cm RDM (yet compatible with SDM), the Wavescape is easy to set correctly, the diamond in the upper panel giving you clear guidance on the amount of tension to apply. In doing so, the leech falls away progressively right down to the two clew eyelets, whilst the main batten above the boom is the only one that retains any contact with the mast. At rest the sail is very flat, with minimal shape to the draft below the boom, and none above. 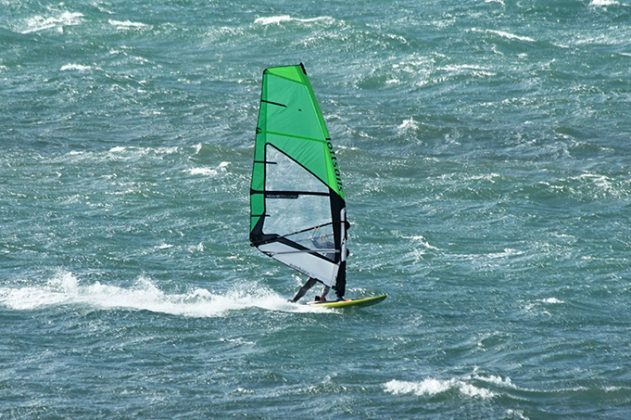 The materials used and attention to detail on the Wavescape is up to the usual Loftsails standards, with x-ply used throughout, a double Dacron head panel for ease and durability while rolling, and a large Velcro opening on the moulded tack fairing for ease and accessibility. It gives the impression that the complete function and practicality of the sail is carefully thought out, not just its performance on the water. Light and easy in the hands at rest, as the pressure builds the Wavescape’s profile fills smoothly, the movement in the luff sleeve combining with the Dacron luff panel to deepen the draft. The pull comes from a high and forward position, yet the delivery is so soft and progressive that there’s not a hint that it will get away from even the most nervous rider, or pull them to their toes. In marginal winds, the drive is subtle, but lessen the tension and the Wavescape responds well to pumping, its reduced luff curve helping the mast to flex and respond. Properly powered, it accelerates beautifully, capable of impressive speeds as the leech twists off smoothly, the three extended mini-battens annulling any inherent flutter. It points high upwind, and whilst it glides through lulls rather than pulling you through them, its soft comfortable manner becomes a godsend in confused corrugated sea states. However, the real purpose and intent of the Wavescape is realised when using it around a wave break. Providing the power to charge around at speed and enter a bottom turn with conviction, it then becomes remarkably loose and light mid-transition as it is eased out and the draft returns to its neutral position. 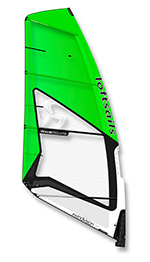 It enables the rider to concentrate on carving and surfing the board, rather than dealing with control issues, the shorter boom helping the sail feel compact and easy to reposition. As the wind increases the lower clew eyelet can be used, raking the boom and helping the rider to pin the sail down. Developed and tested in the howling winds of Tarifa, Loftsails have a reputation for possessing exceptional top end control (unquestionably helped in part by the brand’s trademark Standing Battens), and we have to say this Wavescape is no exception. It was a delight to use, when others were clearly struggling, its manners, balance and useable power continued to inspire.